Tales from Space: Mutant Blobs Attack is a side-scrolling puzzle-platformer about an ornery mutant blob that, after being held captive in a lab that can only be described as something out of a retro sci-fi movie from the early '50's, escapes into the world and sets out on a path to consume everything! Use touch and the motion sensor function combined with traditional analog stick controls to defeat and consume the pathetic humans. Needless to say, I had trouble putting ‘Tales From Space: Mutant Blobs Attack’ down. 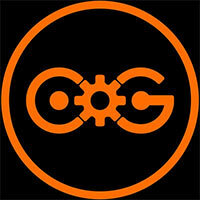 It is a simple game yet easy to pick up and just a blast to play. It makes good use of several of the Vita’s control abilities and the games presentation style works as Tales From Space: Mutant Blobs Attack is a fun and enjoyable rise to the end. This is easily one of the most enjoyable gaming experiences I have had in recent memory. 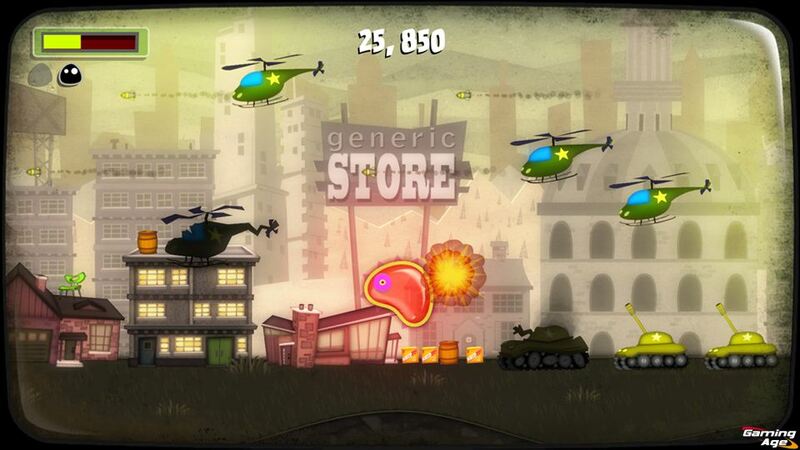 Tales From Space: Mutant Blobs Attack is an absolute must play if you own a Vita. 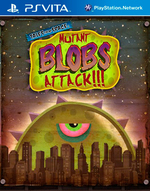 Tales from Space: Mutant Blobs Attack!!! 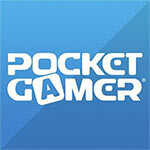 is a great showcase for what digital games can do on the Vita. It’s well-executed, it’s got an appealing look and a sharp sense of humor, and the pacing works well for handheld play. When you’re browsing through the PlayStation Store on your Vita checking around for something new to play, make sure you don’t pass this one up. It’s well-worth your time, and more than worth your money. Mutant Blobs Attack is one of those games that absolutely hooks you from the moment you begin playing it and doesn't let go until the credits roll. The sheer level of charm, personality and playability found throughout the game is staggering and will easily keep you coming back for more. As amazing as the original PlayStation 3 PSN release was, Mutant Blobs Attack basically improves upon just about every facet of that game and produces an extremely enjoyable Vita gaming experience. With its extremely affordable price tag, you're getting a lot of blob for your buck. Tales From Space: Mutant Blobs Attack isn't particularly unique in terms of core gameplay, making its mark instead by simply doing what it does so well. It feels a little too much like a mobile game to stand out as a must-have title, but if you want an example of PS Vita controls done correctly, you won't find a better example than this. It doesn't hurt that you'll get some challenging -- if sometimes frustrating -- physics-based puzzles to boot. 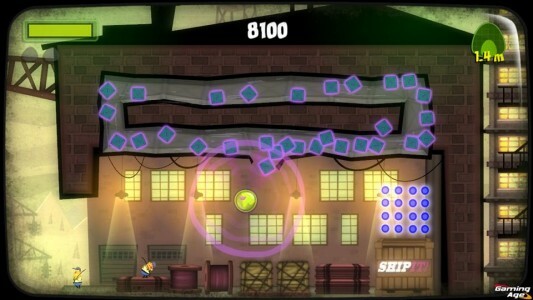 Tales from Space: Mutant Blobs Attack stole my heart. It's visually delicious, the cutscenes ooze with humor, and the actual gameplay feels perfectly balanced. It won't take you long to go through every level, but doubling back to polish off collectables and earn gold medals will keep me playing. When all is said and done, this is an appropriately priced, raccous romp of a platformer. There are hidden goodies throughout each level and more than enough replayability. I guarantee you'll miss most of the jokes the first time through. A new flying gameplay mode has players steer with the left analog stick and hit the X button to propel the blob like some wild rocket. Specific flying zones let you explore for pickups and also challenge you to maneuver through laser hazards and spike-filled tunnels. This gets extra tense when a creeping death wall gets thrown into the mix. It’s a blast balancing speed boosts and the slower, fine movement propulsion to narrowly escape instant crushing death. It’s not a deep game by any stretch of the imagination, but if you’re looking for some classic platforming fun, with an out-of-this-world twist and dirt cheap price tag, then Mutant Blobs Attack hits the sweet spot. It definitely straddles the line at times, but overall we were far too blown away by the puzzles and content for this to be a serious issue. 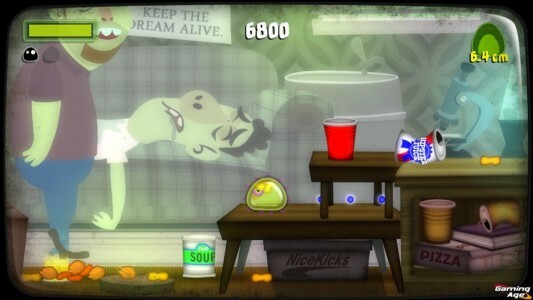 ...Tales from Space: Mutant Blobs Attack is the best downloadable launch game for the PS Vita. Nonostante PlayStation Vita offra una serie di titoli sicuramente più all'avanguardia in termini di qualità tecnica, nella sua lineup c'è spazio anche per giochi concettualmente più "semplici" ma lo stesso appezzabili. Col suo stile mutuato dai vecchi platform puzzle anni '90, caratterizzato da una grafica bidimensionale colorata e da un gameplay immediato ma nel contempo ben strutturato, Tales from Space: Mutant Blobs Attack si rivela essere a conti fatti un titolo assolutamente valido, divertente e in grado di offrire una manciata d'ore di allegria e di sfida agli utenti, soprattutto se questi ultimi decideranno di impegnarsi a raccogliere tutti gli oggetti presenti in ogni area e lotteranno per ottenere il miglior punteggio possibile.